An email newsletter service that makes building, sharing, and tracking emails quick and simple tasks–how many times have we all heard this one before? 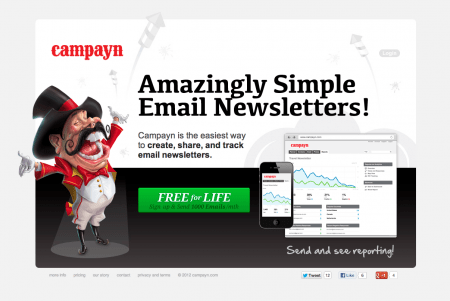 Startup Campayn recently joined the newsletter circus, promising to deliver a great show and take the pain out of email marketing campaigns. They just might have the right magic to astonish us all. 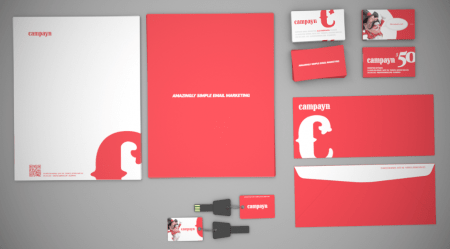 Originally a small, graphic design company, a challenge put to the team by a client sparked the unexpected evolution of Campayn into a software service. An impressive contortion act not to be missed firsthand–a story of hard work, opportunity seized, entrepreneur turned human cannonball…or something like that. Alek Mirkovich is the founder and pitchman behind Campayn. He recently invited KillerStartups inside his company’s tent for a better look at the work behind the fire-breathing, lion-taming email service. I love the word ‘campaign’ because I think everyone should approach the work they do as a campaign for something. We found that campayn.com was available, and we then created a circus theme around it. If the bearded lady and acrobatic elephants need to be promoted, then so does your business! Now that the brand is built out, I actually prefer the misspelled version, because it’s a word we now own, 100%. I think it’s powerful – if you see it once, you remember it. Campayn started out with me. I designed the logo and pages and how it should work, but we now have seven other people who contribute to Campayn. 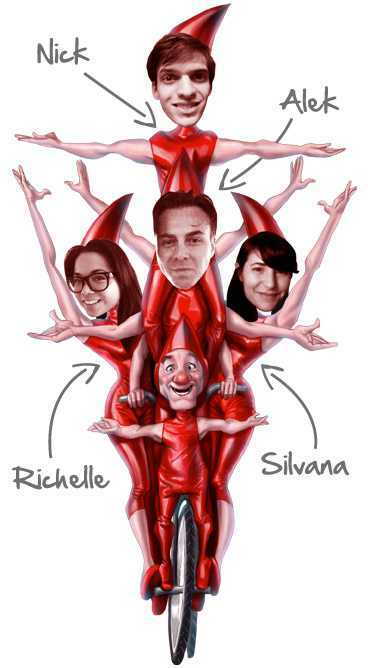 I am really, really fortunate to have a great team. I’m most grateful for our lead developer Nick, who lives in Serbia; he has been with me since the beginning. I have yet to meet him in person, but I’ve worked with very few people who’ve shown the level of commitment that he has. Commitment is a powerful thing, and I’ve found that truly committed people are ten times more valuable than those simply in it for the job. Inspirational Dude – William Booth. William Booth was the founder of the Salvation Army, and is one of my inspirations. The idea that someone could create this good-will machine and have it grow and help others long after their death is pretty remarkable. Some of the most influential people of our time will be forgotten in 20 or 30 years, but Booth’s legacy and ideas are still working 100 years later. Work Ethic–I don’t play the lottery, because I wouldn’t want money that I didn’t earn. I’ve seen a Jim Rohn quote that reads: “The miracle of the seed and the soil is not available by affirmation; it is only available by labour.” There’s something about combining your thoughts with labour and working hard towards your goals that just seems so right and, hopefully, in the end rewarding, too. That’s a whole story in itself, but essentially we developed some software for a local telecom company that allowed their dealers to customize marketing material, like brochures, newspaper ads, and emails. We charged somewhere around 25K to build the first version. This project became so successful, even winning internal awards within the company, that we decided to build a whole business around it. Fortunately we owned the rights to the technology behind the service, so we made some changes and built Iterro, which mainly services companies that have dealers, branches, or franchisees. That company still exists today and it basically funded the development of Campayn. So in a nutshell, we started with $0, got paid to develop a software solution that we then used to create a company, and we now resell that same software to other companies. I wonder if I should write a book on how to start a company with zero dollars? I’ve made many! The biggest mistakes I’ve made were allowing ideas to get too complex before they were ever exposed to the world. I’ve let ideas build to a domino effect, and too often some things I think will work a certain way don’t. My philosophy around this now is to start small, but make it perfect. It’s about finding that balance. You don’t want to be just rushing to ship something because most clients will give you only one shot, so it needs to be really good, and so you remove all the features that are not critical. With Campayn we started with a much larger idea, and even designed a much more complex solution–but, thankfully before we started to code, we made the decision to simplify. After 11 months of development, boy am I glad we did. I also wish I edited the team faster! In every case where I thought someone wasn’t a good fit and I wanted to give them more time, it never worked out. I am grateful for all that I have, and my life is pretty good, but for me to truly feel successful I will need to contribute and be of real service to others. I want others to really feel like I’ve helped them in some way. Improving people’s lives by helping them grow their business is my goal. Some cash wouldn’t hurt, either! The tabs that are always present in my browser are Google (Gmail, Calendar,) 37 Signals products, Evernote, and our own Campayn. Quora. Great when waiting in lines or just killing time. You’ll know a lot about us when you try out Campayn. We worked very hard to make things simple to use. Our people are not only committed to the company, but to our customers! We also love to know the fact and figures. Any specific numbers you’d feel comfortable sharing with us.? 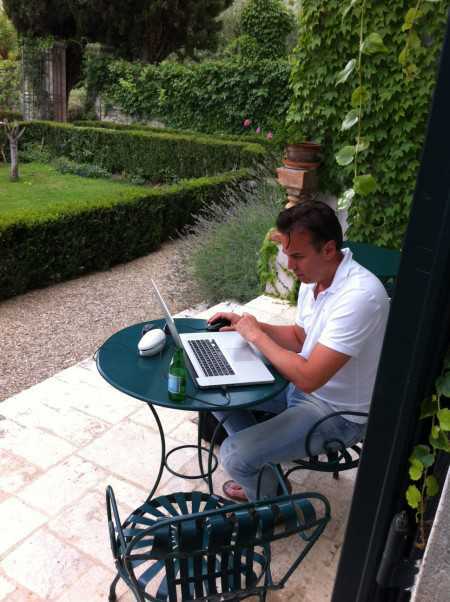 We’ve invested significantly less than most startups by having a 100% distributed team where we all work from home. We are very new, but our revenue is growing. We have a ‘freemium’ pricing model that allows people to send 1,000 emails per month free, and that’s called our ‘Free for Life’ plan. We don’t expect to see any serious revenue for a while, and we’re prepared for that. Courtesy of Founder and Campayn.